We could all use more light in our lives, and good design provides. Dusseldorf-based architects Falkenberg Innenarchitektur have transformed a compact 1950s home in Germany into a stunning minimalist retreat. 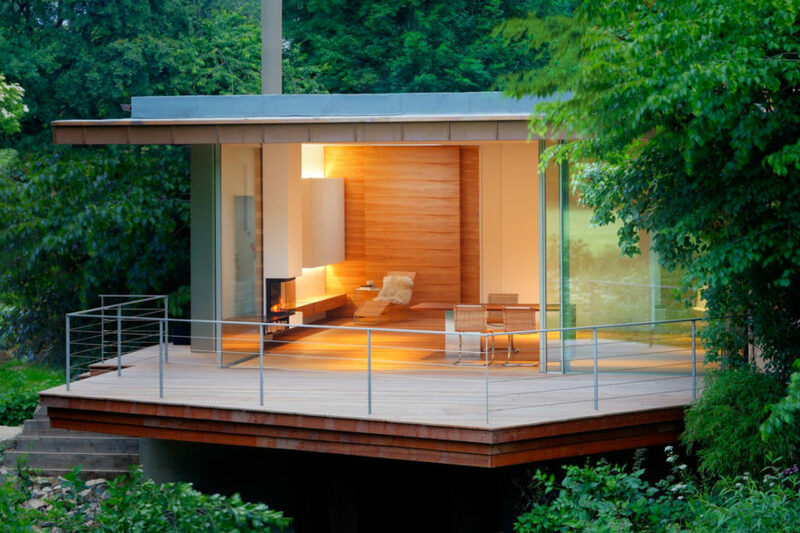 Tucked into an idyllic forest surrounded by the River Nethe, the renovated Haus Rheder II features three main essentials: light, air, and tranquility, lending a subtle sophistication to the arboreal design. From the start, the architects wanted to preserve the original character of the 65-year-old structure. Thankfully, the designers managed to keep the existing floor slab and terrace space that cantilevers over the river. To take advantage of the idyllic location, floor-to-ceiling sliding glass doors were installed that open up to the timber deck, offering amazing views of the surrounding Rheder country park. The interior space is 90 square meters of open space with scant furniture and virtually zero clutter. The heart of the home is the fireplace that sits in the middle of the living space. A ceiling-height partition separates the living room from the bedrooms and a small bathroom, all of which count on skylights for optimal natural light. Also on the interior is a technical room that acts as a control center for the home’s technology, all controlled by an app. 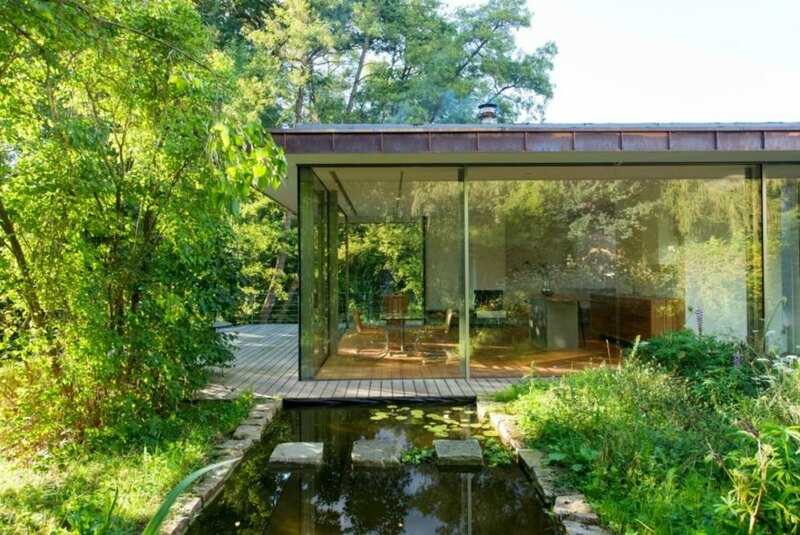 The large windows and wooden deck help bring nature into the manmade space, but is further enhanced by the home’s reflecting pool on the southeastern side of the home. Sunlight streams into the living space during the day, further creating a seamless connection between the interior and the exterior. From the start, the architects wanted to preserve the original character of the 65-year-old structure, which was in fairly bad shape. The designers were able to preserve the original floor slab and terrace space that cantilevers over the river. To take advantage of the location, floor-to-ceiling sliding glass doors were installed that open up to the timber deck, offering amazing views of the surrounding Rheder country park. 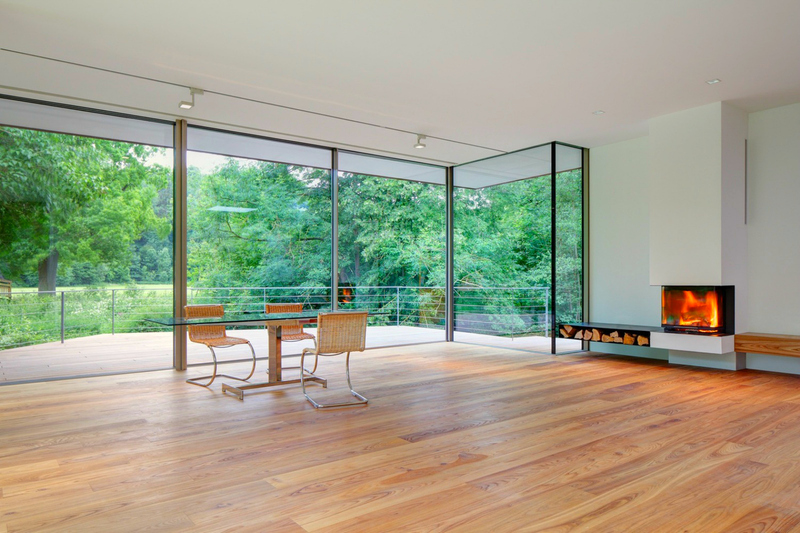 The large windows and wooden deck help bring nature into the manmade space. The home's reflecting pool on the southeastern side of the home streams sunlight into the living space during the day, further creating a seamless connection between the interior and the exterior. According to the architects, leaving the interior space open was essential to the renovation process. The interior space is 90 square meters of open space with scant furniture and virtually zero clutter.